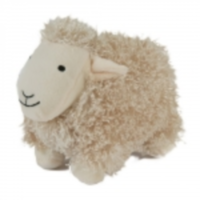 Curly Pet Lamb is an extra soft cuddly curly pet which includes a fun squeaker. This soft toy character is a great toy, destined to be your dog's best friend to play with and for comfort. Curly Pet Lamb makes an excellent comforter for those dog who love to snuggle up. Please be aware the colour of this toy may vary and cannot be guaranteed. As the previous reviewer mentioned, the sheep is very pink. When "Sheepie" arrived, I wasn't sure how long it would survive, but it's actually just under a year. And trust me, that sheep has been taken everywhere - to bed, ragged round the garden at high speed, thrown across the living room for hours at a time...you get the idea. It's even survived the wash a couple of times (and yes, Sky did sit watching it go round and round and no I didn't video it, damnit!) I'm finally having to reorder as Sky has been gradually removing the inner fluff through a small hole she created. After a very nasty evisceration incident last night, I feel that Sheepie really is no more. For the money, it's been baaaah-rilliant! I was happy with the quality of the product, and its good value for money, but when my order arrived my sheep was PINK! (not white as in the photo) Both my dogs are boys and I would not have ordered a pink toy if I had know.